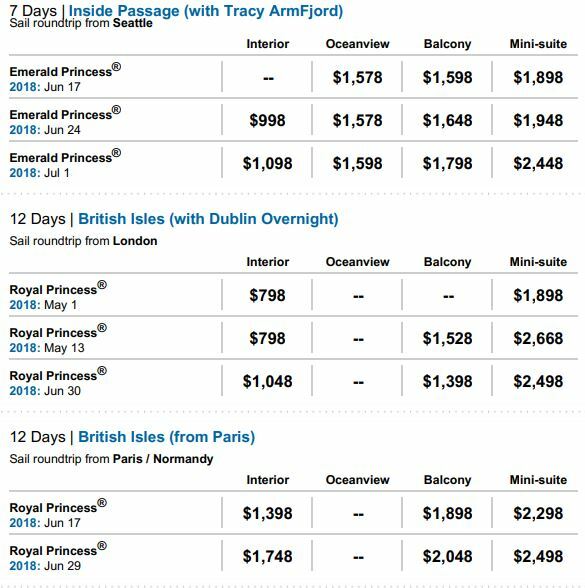 Princess Last-Minute "Drop & Go" Departures, with fantastic rates!!! 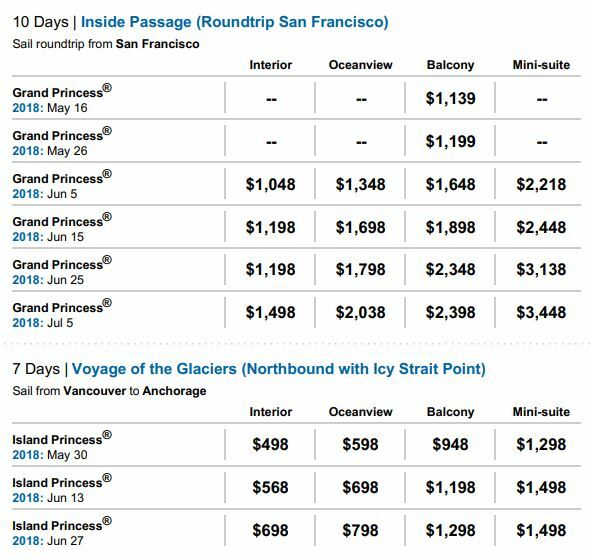 FARES ARE CRUISE ONLY, NON-REFUNDABLE, PER PERSON, BASED ON DOUBLE OCCUPANCY, SUBJECT TO AVAILABILITY, CAPACITY CONTROLLED AND INCLUDE NON-COMMISSIONABLE FARE. STATEROOM ASSIGNMENT IS NOT AVAILABLE AT TIME OF BOOKING. BOOKINGS WILL BE ON A "GUARANTEE" STATUS. OFFER APPLIES TO MINIMUM LEAD-IN CATEGORIES AND EXCLUDES SELECT CATEGORIES. 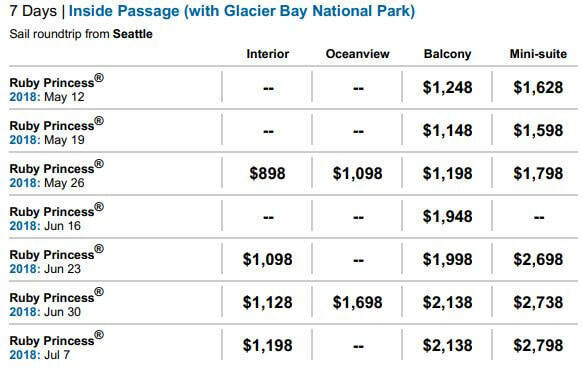 Balcony and Oceanview staterooms may have an obstructed view. 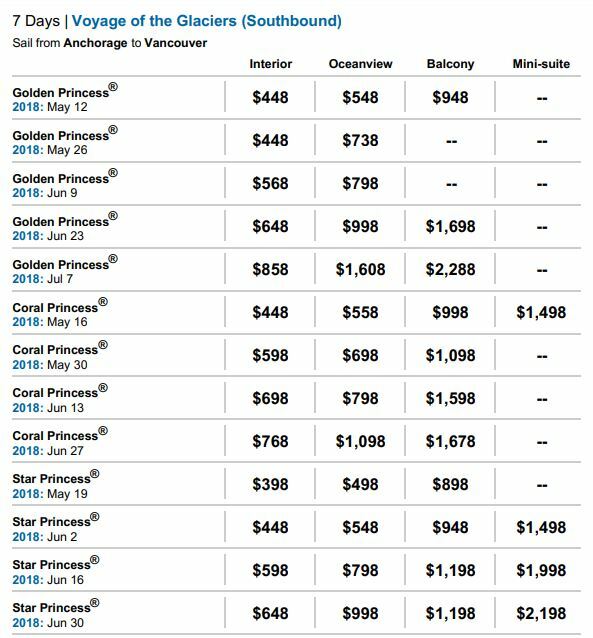 Additional stateroom categories may be available at higher fares. This offer applies to lower berth passengers and is available for new individual bookings only. Offer is available to Selected Account Agencies only. Full payment due within 24 hours. Cancellation fees will apply. Name changes and waitlists not allowed. 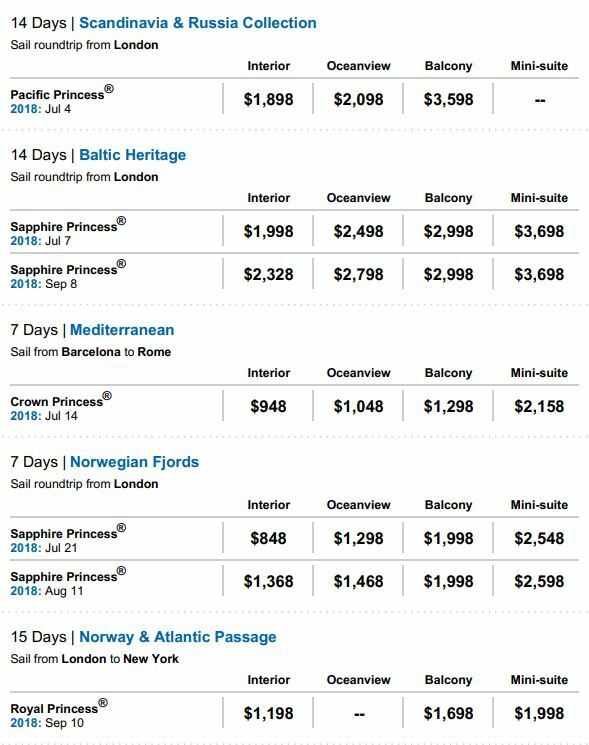 Offer may not be combinable with cruisetours or other discounts, including shipboard credits. Offer is not combinable with groups. This offer is available from 01/05/2018 5:00 am PDT - 01/11/2018 5:00 pm PDT. Please refer to Polar Online for Taxes, Fees and Port Expenses which are additional and subject to change. 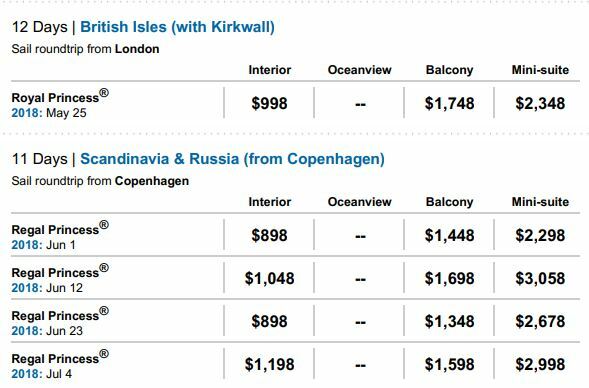 Transfers to/from ship/hotel are not included in fares. 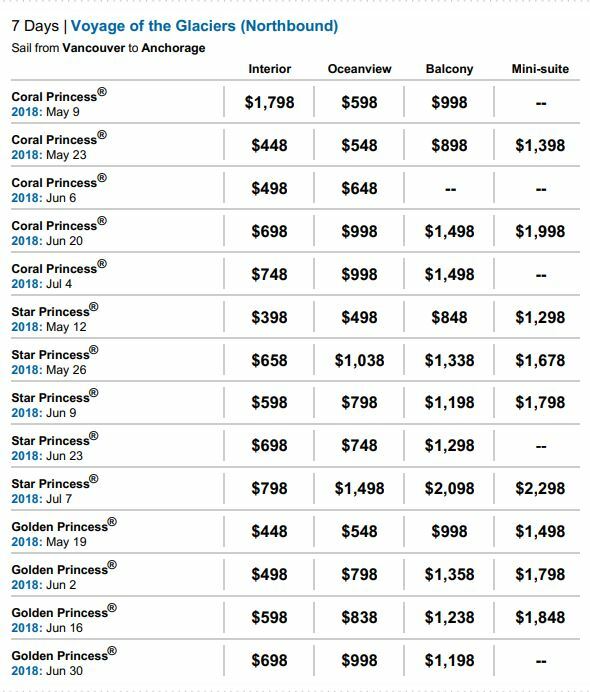 Please refer to the applicable Princess Cruises brochure or princess.com for terms, conditions and definitions which apply to the booking. Fares are quoted in U.S. Dollars. 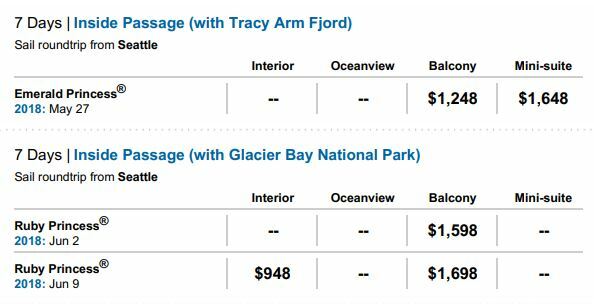 These fares may not be advertised on the Internet. This communication is being sent to the email address you gave us when you asked to be added to our bulletin list. If you wish to change the email address used by Princess, please contact us by phone at (800) 421-1700 or by fax at (661) 753-0180. Note: For assitance reserving a wheelchair-accessible stateroom, please contact customer service at 1-800-774-6237.